Sikkim Democratic Front party on Monday has strongly criticised and condemned the false and baseless statement of SKM president, PS Golay. The ruling party has suggested Golay to update his knowledge first before giving any baseless statement. An SDF press release issued by its general secretary DB Katwal said that to hide his misdeeds and corruption cases the convicted leader PS Golay has shamefully attacked the conscience of the people. Katwal said acts of Golay to project himself as innocent after indulging in corruption have shown his hypocrite character. The release added that SDF was the party working as per the suggestion and needs of the people and do not expect anything from prejudiced political party which aim was just to grab power. The release added that the statement on making Mintokgang as cancer hospital shows the lack of knowledge of the leader on infrastructures, equipment and needs of a hospital. It added that the people were all aware on the intention of such leader that his dream was not to make cancer hospital but has just targeted the seat of chief minister. The release mentioned that Golay has copied this statement from Pakistani Prime Minister Imran Khan. The release mentioned that Mintokgang was the fort of development and rights of the people. 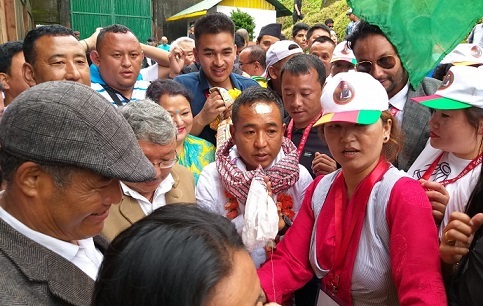 While mentioning that 1000-beded hospital along with a medical college has been ready in Sikkim, the ruling party has suggested Golay to update his knowledge before giving baseless statement. The release stated that the people have been undergoing good treatment at Oncology Section of STNM hospital and the government has been sending patients of Sikkim to Rajiv Gandhi Cancer Hospital, Apollo New Delhi and other hospitals in Mumbai for further treatments. The release said despite spending one year in jail after being convicted under PCA 1988 in a corruption case, there was no change in the behaviour of Golay.